Where is located 2007, 2008, 2009 and 2010 Chrysler Sebring cabin air filter? Chrysler Sebring cabin air filter which is also known as dust filter, pollen filter is located on the passenger side behind the glovebox compartment. How to replace Chrysler Sebring cabin air filter? Push in on the right and the left side of the glove box compartment to release the stops. Remove the damper cord from the glovebox (for this you can use a screwdriver) and leave the Chrysler Sebring glovebox to hang down. After doing this you can view cabin air filter housing cover. Unclip cabin air filter housing cover from the left and the right side and remove it. Now you can see cabin air filter. Remove the old Chrysler Sebring cabin air filter by pulling out. 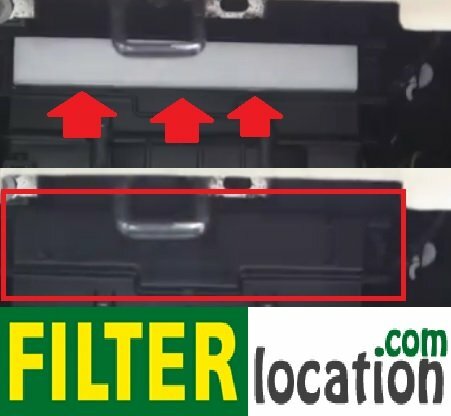 Insert new 2007, 2008, 2009 and 2010 Chrysler Sebring in the cabin air filter housing with the air flow indicating arrow pointing down. Install the cabin filter housing cover back in place. Install damper arm back in place. Push in left and right on the glove box and re-engage the stops in the dashboard. Cabin air filter protects you against bad odors, pollen and other allergens.